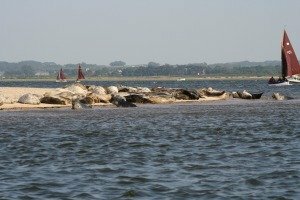 The seals in Norfolk are truly one of the county’s most special sights to see. Without any doubt, it is an incredible WOW factor and one that you must see when in Norfolk. 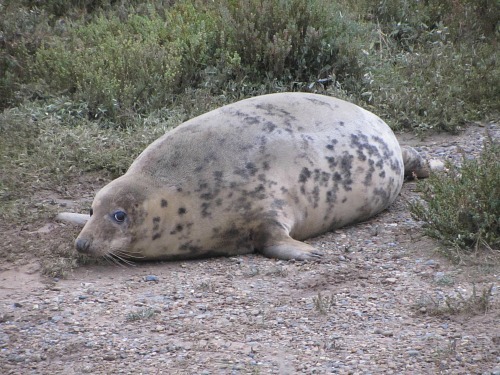 Whether you come to see them with their seal pups in the winter months, or watch them basking in the sun in the summer months, this spectacle in Norfolk is an all year round activity to enjoy. 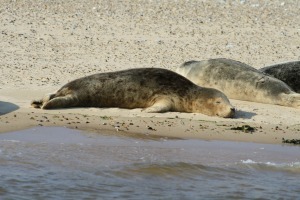 The colonies of Common and Grey seals in Norfolk are growing rapidly every year. This is very exciting, and it also means you now have a fantastic chance to see this incredible sight for much of the year. And whether you’ve got children with you or not, I'll guarantee that you'll love these cuddly creatures! 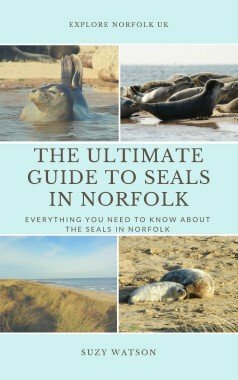 For your guide of where, when and how to see the seals in Norfolk, why not buy this downloadable pdf which has all the information you need in one place. 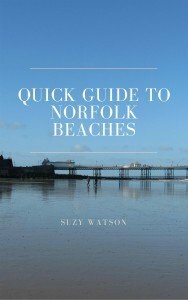 It's your Ultimate Guide to Seals In Norfolk. 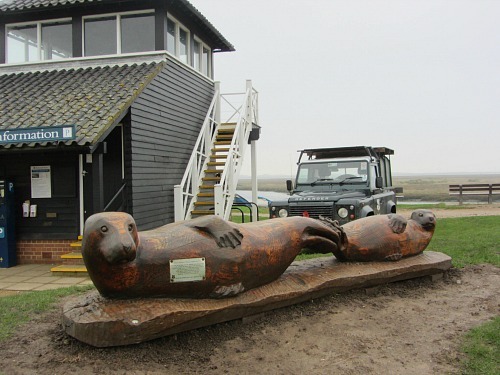 It has everything you need to know about seeing the seals in Norfolk, whether it be at Blakeney Point in the summer months or Horsey Beach and Blakeney Point in the winter months, how to get there, info on the boat companies, best time to see them etc. "Thank you very much, can't wait to go and see them, and you book is very useful"
When and where can you see the seals in Norfolk? 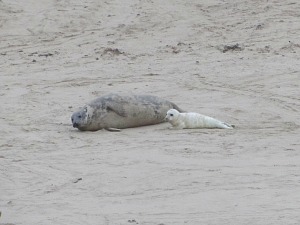 This is the best time to watch the Grey seals and their pups. 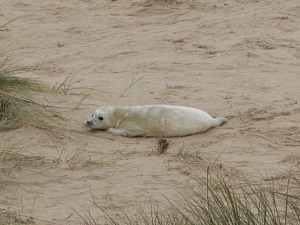 The larger Grey seals come in huge numbers to give birth at both Blakeney Point and Horsey Gap. This is the best time to see the Common (slightly smaller) seals and their pups at Blakeney Point and on the sandbanks off Hunstanton. 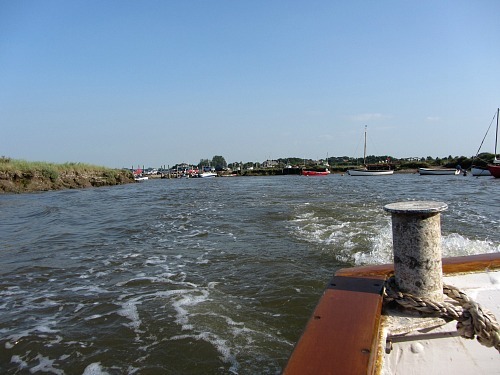 During the summer months you can see the seals by taking a boat trip from Hunstanton, or a boat trip to Blakeney Point (or you could walk from Cley to Blakeney Point). The Common seals appear from June and have their pups until about August so there’s plenty of time to catch this spectacular sight on the North Norfolk coast. You can see some suggestions on boat trips here. If you're happy to just see the grown seals without their pups then you can pretty much see them all year round. The boat trips operate 52 weeks of the year. 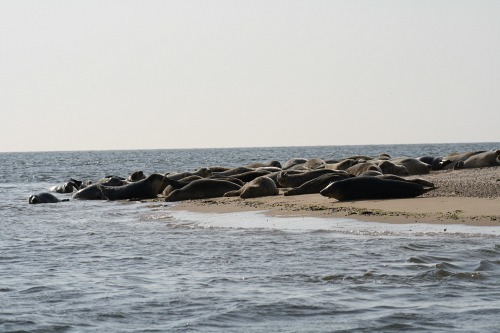 Searles Boat trips from Hunstanton take you out in an amphibious vehicle to one of the many sand banks that appear at low tide in The Wash to see the basking seals in their natural environment. 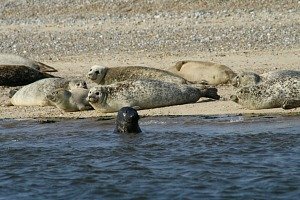 The other place to see the Common seals in Norfolk in the summer months is at Blakeney Point and there is more information here on the seal boat trips to Blakeney. There are numerous boat companies that take you out to the Point, usually from Morston Quay, and you get spectacular views of these wonderful Common seals bobbing up and down in the water or lying on the sandy spit. 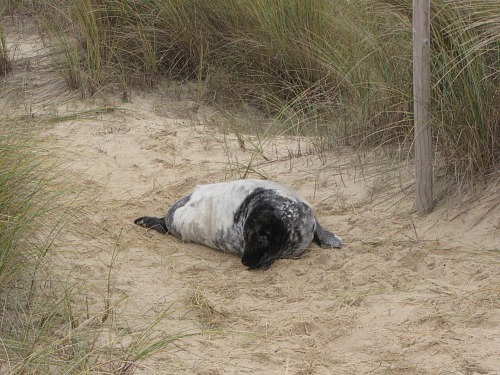 During the winter months, the Grey seals come to give birth at both Blakeney and Horsey beach, usually from November until the end of January/beginning of Febreuary, Horsey being the more accessible place to spot them. At Horsey beach, miles and miles of sandy beach covered in these wallowing seals. At Blakeney Point via a boat trip, or again you can walk along the shingle from Cley to the Point and back again (but you should make sure you know the tide times and quite how difficult and exhausting it is to walk over the shingle (unless you go at low tide). 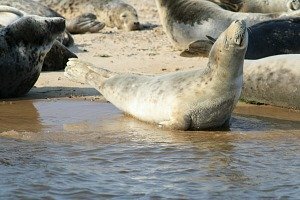 Where is the best place to see the seals in Norfolk? 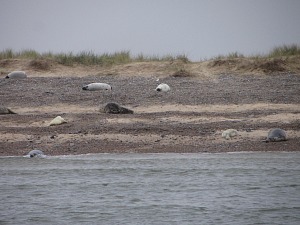 In the summer months the best place to see the seals in Norfolk is without doubt on Blakeney Point. There are so many and you just get such an unexpected sight of these wonderful creatures as the boat turns around the corner of the spit and there they all are. 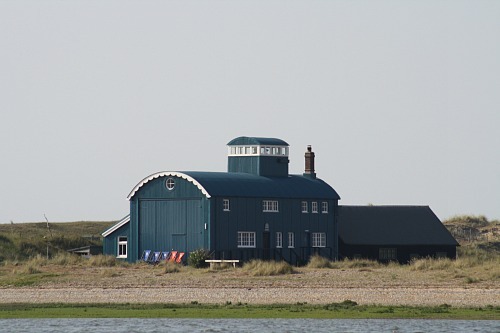 You also get to see the all the varying wildlife such as terns with fish in their mouths, oyster catchers and numerous others, the iconic blue old lifeboat station and the thrill of sailing up the creeks amongst all the other sailing boats tinkering on the water. In the winter months, I would say that was debatable as to the best place. Blakeney or Horsey – hmm. I suppose it depends where you’re staying. I have to say I got a huge thrill from both places, and both incredibly different. 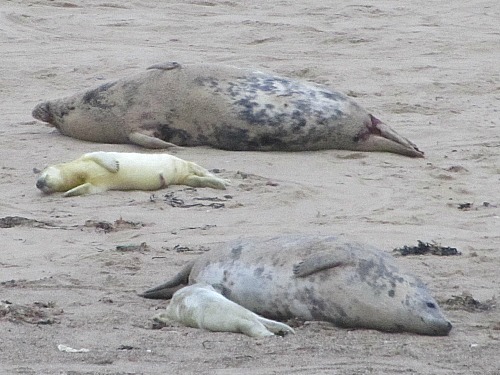 Seeing the seals at Horsey is much more accessible, you can walk along the back of the dunes and up over onto the dedicated viewing platform all day and get a view of the vast expanse of beach covered with seals, cow and bull, and their pups. You can also walk along the cordoned off path for a long way, admiring nature at its best. I can’t put into words what an incredible sight it is. 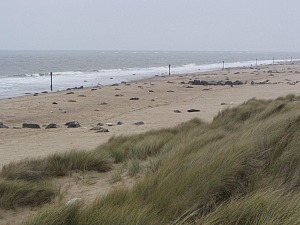 Winterton beach also has a few seals in the winter, but nothing near as numerous as Horsey. Horsey is also free, apart from the car parking charge which is machine operated. Blakeney, on the other hand, is a sort of hands off approach, unless you are privileged enough to get on one of the two National Trust seal tours where you land on the Point with a National Trust watcher, and get a guided tour around the Point and see the seals that way. 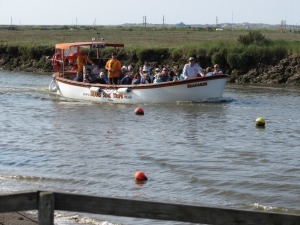 Otherwise it’s the boat trips from Morston Quay, all of which are excellent. The National Trust are hoping to do more trips in the coming years. 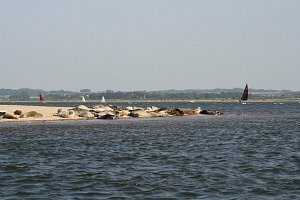 Why do the seals love Norfolk so much? 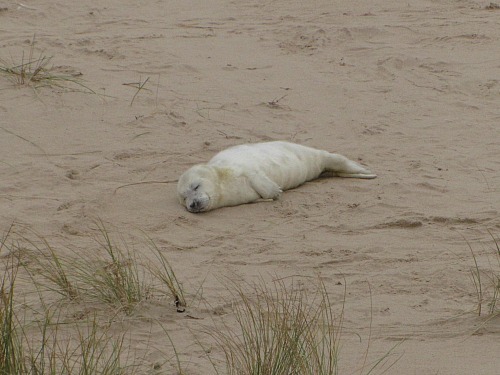 One of the main reasons that the seals in Norfolk are here in abundance is the huge expanse of flat sand and shallow waters which is perfect for giving birth, as well as the dunes that protect them. They are more likely to survive here than other seal colonies around the rugged coast line where the tide bashes against them. Dogs and seals, or any wildlife for that matter, do not go together! It is vitally important that dogs are kept well under control, particularly during the winter months when the seal pups have been born, for obvious reasons. I know we do all love our dogs, but sometimes they are best left at home, and I think this is the perfect time to leave your pooch behind and just enjoy this rare sight. The seals in Norfolk would prefer not to see you, sorry!! If you see any seals by themselves, you shouldn’t approach them as they can be vicious. The best thing to do is to contact the RSPCA. 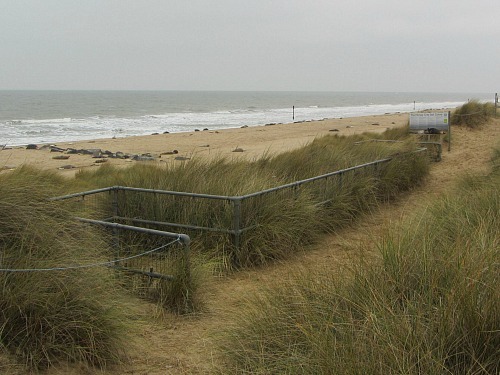 Any ill seals from Norfolk go straight to the RSPCA East Winch Wildlife Centre where they are treated and released back to the sea when ready. Their phone number is 0300 123 0709. Here are some seal facts for you! The Grey seals, which are the ones that arrive in the winter, are the largest mammals on British shores, and are also known as Atlantic seals. You can see the difference between these and the Common seals as they are altogether much bigger and have a much longer snout than the Common seal. The seals only have one pup a year, probably because they use so much energy feeding their newborn, and the pups put on 2kg a day when suckling. A mother Grey seal lives for 35 years, whereas the male lives for 25 years and they can dive 70 meters in the water, but can only be under the water for about 30 minutes. The mothers’ feed their pups for approximately 2-3 weeks. They can swim at about 19km an hour and on land they can move at the pace of our jogging. When they are first born, the seal pups have a yellowish fur, which then turns to white, and eventually to the mottled waterproof coat you can see in the picture below. It’s very difficult to put into words what an amazing experience seeing the seals in Norfolk is, both in the summer and winter months but I hope you’ll take the opportunity to see these wonderful creatures, and then you’ll understand what I mean! 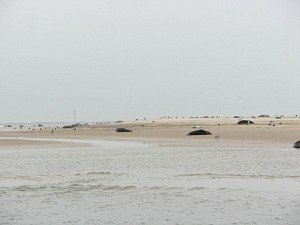 For more on the boat trips to see the seals at Blakeney Point, visit my page on seal trips, and for more on the seals in the winter months at Horsey beach, go over to seals at Horsey here.